Got an RX8? Replace your coils! Anyway, the engine requires oil in the combustion chamber(s) to lubricate the rotors. 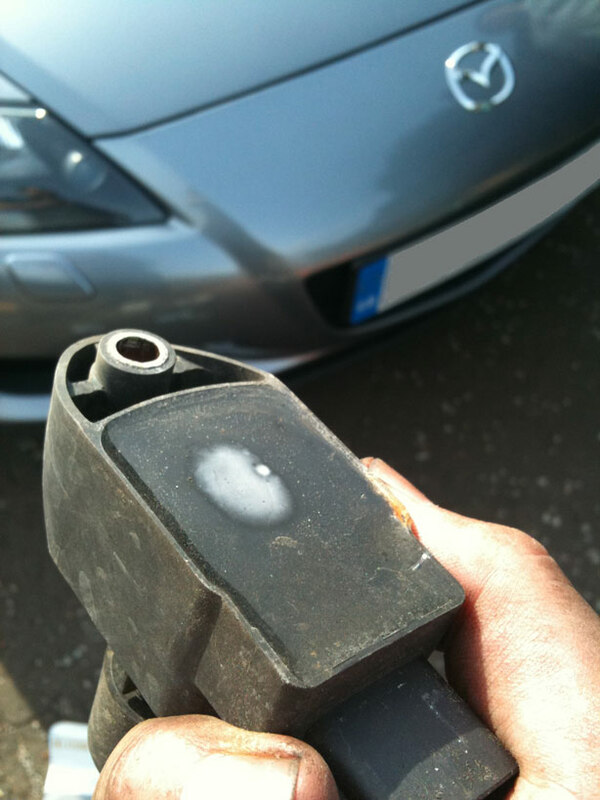 Petrol dissolves the oil and which can lead to the rotors failing and you being left with a large bill. But what does this have to do with ignition coils? Due to the way rotary engines operate the coils are worked very hard. At 9000rpm the coils and spark plugs are sparking 150 times a second. This leads to them running rather hot which causes the insulation on the coil to break down which means a shorter path for the electricity to arc to where it’s not supposed to (somewhere other than the spark gap of the plug). Eventually the coil will fail and stop providing enough voltage to the spark plug, which means the spark plug is going to stop sparking. Less sparks = Less petrol being burned. Change your coils regularly, at the same frequency as your spark plugs (about every 3 years). My car had 28,000 miles on the clock and was just over 5 years old when I changed mine. They are fairly easy to change yourself, the main pain is removing the airbox and bellows to get at them, once that’s out of the way it’s just the matter of getting them connected up to the right leads. They are very expensive from Mazda UK. Happily, however, you can buy a set of 4 of them from Rotary FX for the same price as Mazda UK will charge you for a single coil. All 4 looked like the picture below, 2 of them had failed completely when tested with a multimeter(both trailing plug coils). Since the replacement there’s not a lot of difference at low revs but higher up the rev range the difference is a lot more noticeable. Mine just failed, started losing power at low range, then juddering in second gear the mis firing then failing to start, three had gone, Mazda replaced all four, £541, ouch!!! May do it myself next time! Great advice – this is the Achilles Heel in an otherwise fantastic car and possibly the reason the early ones got a bad reputation. I changed the coils on mine (’07 model) when it developed a slightly rough idle. There is a noticeable improvement in starting (it was never bad, but is now instant), idling and overall performance. I guess the coils degrade over time and you just get used to how the car feels. The car had done 46k miles when I changed the coils, leads and plugs and all four of the old coils had signs of overheating.